11th October 2018: A new restaurant called Jacob’s has taken this space – my review. We’ve been visiting Oliva for several years. A couple of years ago the place was taken over by the people who run Café Amandine. The interior design and the menu are similar but a little better than before. 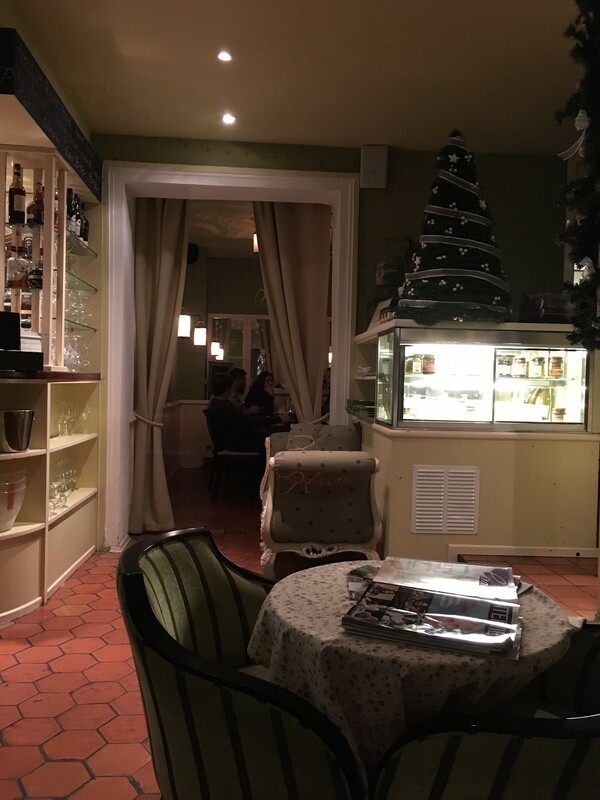 It’s quite a cosy place and certainly feels like a restaurant rather than just tables and a kitchen. The restaurant is a few streets away from Vyton tram stop. Oliva is probably the best restaurant in that area of town. Nice bread and olive oil are always served and don’t appear on the bill. A carafe of tap water is 25Kc, which I think is pretty reasonable – not sure if that includes unlimited refills. A bottle of decent ‘Hob Nob Merlot’ is 550Kc. We like a starter-size portion of the Marinières de Provence mussels 300g for 165Kc – although on our last visit the waiter got confused and we had the full 600g (265Kc) each as a starter. So make sure you emphasise the starter portion if you order. There’s a good selection of shellfish, fish and meat on the menu. I’d like to see more pasta dishes, especially as the ‘Linguine with octopus, Marinières de Provence mussels on white wine and herbs’ 235Kc is a bit samey if you have the mussels as a starter. Service is friendly and professional, without being too formal. Writing this review, I started to wonder why we don’t visit Oliva more often and I think it’s probably the price. You’ll probably spend around 1700Kc here. We tend to eat locally at around the 900-1200Kc price point and then splash out for a dinner in somewhere like Sansho. Oliva sits in between these two and so we tend to neglect it – too expensive for a Wednesday night, not amazing enough for a special occasion. If there was more pasta on the menu, we’d likely visit more often for perhaps a small bowl of mussels and a pasta. Nonetheless, I’d recommend this place and I’m sure you won’t be disappointed with your visit. Monday – Saturday: 11:00 a.m. – 11:00 p.m.
*kitchen is open until 10:30 p.m.